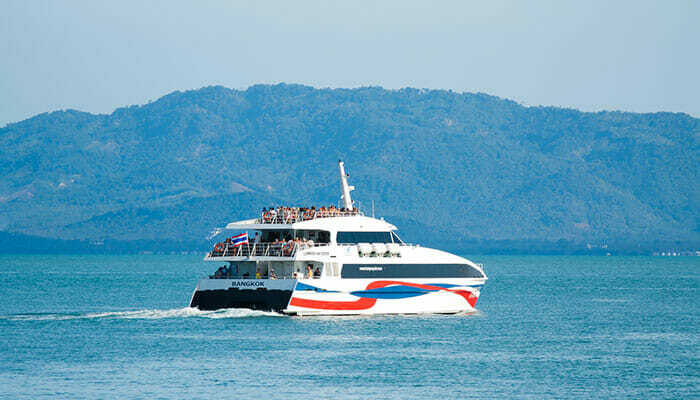 There’s an assortment of different routes to get you to Koh Samui and they all involve a ferry ride. While there is an airport in Surat Thani and one on Koh Samui, there are no airlines offering a flight between these two airports because they are so close together – only about 35 kilometers (22 miles) separates them. If you did want to fly to Koh Samui you’d have to go via a different city, such as Bangkok, but when there are so many different ferry companies offering seats, a flight would definitely be a very costly, and not necessarily any quicker, alternative. One other option is to make your own way with a rental car. Two of the ferry operators do have car ferries from Surat Thani to Koh Samui (Raja Ferries and Seatran), so if you already have a rental car and enjoy the convenience, you should consider taking a car ferry over to the island. Bearing the above in mind, ferries are by far the recommended way to travel between these two places. And there are many different ferries to choose from so you can select a ticket for one that best suits where you want to depart from. All the different operators offer combined bus and ferry tickets so you don’t have to worry about making your way to a ferry terminal, miles from anywhere! If you’ve just arrived at Surat Thani Airport, you can get to Koh Samui from there, or there’s an option from Surat Thani Train Station if you came by train. You can also travel from right in the heart of Surat Thani which is great if you’ve stayed in the city overnight, and, this option is made even more convenient if you add a hotel pickup to your ticket because then you don’t even have to worry about making your way to office pick-up points. The four ferry companies covering this route are Songserm, Lomprayah, Seatran, and Raja Ferry. As mentioned above, the different companies offer different pickups and departure points, so which one you choose to travel by will likely depend upon where you are in Surat Thani to begin with. The important thing to remember is that combined bus and ferry tickets are always available, and while these are not necessarily any cheaper than buying separate tickets, it just adds to the convenience and gives you one less thing to worry about. You can also go one step further with a combined ticket and purchase one that also covers you once you arrive on Koh Samui, transferring you direct to your hotel if you love to take advantage of door-to-door service. If comfort is important to you, you’ll be interested to hear that the ferries do vary. The high-speed ferries tend to be newer and better equipped than the car ferries operated by Raja Ferries. The journey time (ferry crossing) is around 90 minutes and the seating is comfortable enough for this duration, however, other facilities are limited and may not be up to the standards of discerning travelers! 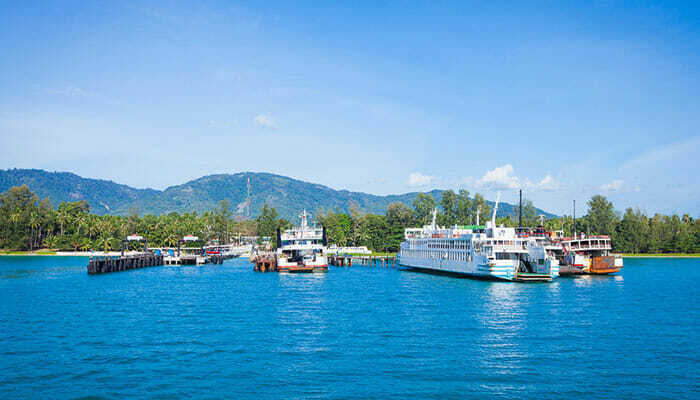 To add some possible confusion to your ferry from Surat Thani to Koh Samui, there are several different ports, depending on which operator you choose, and in turn these arrive in a couple of different places once at Koh Samui. So again, deciding which one to use may be influenced by where in Koh Samui you are heading. If you have booked accommodation in advance be sure to check which port it is nearest to so as to avoid a lengthy journey to your hotel. The main Surat Thani ferry port is actually at Don Sak, which is about 60 kilometers (37 miles) by road, hence transfers from the city to this port can take a while. From Donsak, there are three companies that terminate at Nathon Pier on Koh Samui: Songserm, Lomprayah, and Seatran. There is also the Raja Ferry port at Donsak, and these ferries terminate at Lipa Noi Pier, just a few kilometers south of Nathon. There is one final option for a ferry from Surat Thani to Koh Samui. The night ferry departs from the Ban Don pier in downtown Surat Thani. This is the only overnight option so could be good if you’ve arrived in the city later than expected and you don’t want to pay for a hotel room for the night. 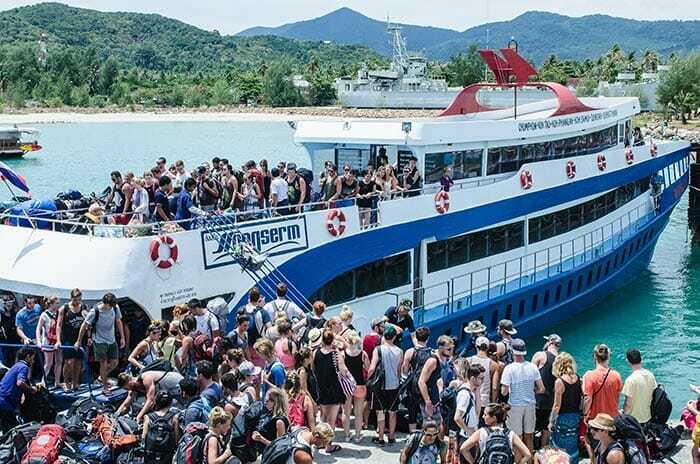 These ferries are quite basic so don’t expect a nice space to sleep, however, if you prefer to travel overnight and want to arrive in Koh Samui early the next day, this is a good option. The ferry departs at 10pm and arrives at Nathon pier on Koh Samui at 4am.